The upgrade consists in the replacement of the entire cutting, tensioning and unwinding unit with a new, more efficient model, easier to maintain. Due to the increasing production exigencies and to a higher frequency of working shifts rotation, it became necessary to develop a new solution for a more reliable control of all steps of the shrinking process, by making such steps as automatic as possible in order to keep a constant quality level, independent of the manual adjustments made by an operator. The film was unwound directly from the knife group and measured according to the diameter of the rubber rollers and to the number of revolutions for every machine cycle. This calculation was then integrated to the tension control, by combining a mechanical cam and a proportional valve which drove the pneumatic brakes of the reel-holders, in order to keep the film constant tension. The system was operating properly, but it was sensitive to the changes in inertia (huge weight difference from the beginning to the end of the reel) and strictly related to the operator's skills. The new functionality introduces a new, fully electronic system equipped with its own software release, where the length of the film to be delivered is calculated by two ultrasound sensors and transmitted to the PLC which consequently drives the brushless motors directly installed on the reel-holders. The system detects the circumference of the reel, calculates the length per every turn and delivers only the necessary film for each pack to be wrapped. As a consequence, the reel tension is constant at every point, thus preventing tears, stretching or missing cuts caused by reduced tension. This process is also controlled by a position transducer installed on the tension rollers, in order to detect any anomalies which might interrupt the shrinking process (red part, picture no.2). For machines with double and triple lane, the new device is also equipped with the electronic centering of the film on the product. 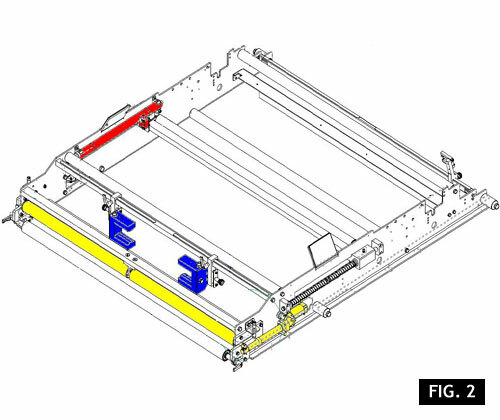 This function is carried out by two edge-reading photocells (blue parts, picture no.2): once they are correctly positioned, they detect the lateral shifts of the film and compensate them immediately by enabling the corresponding actuator (yellow parts, picture no.2). This group gives the possibility to correct the lateral shifts of the film in case of errors inferior to 3 mm, thus allowing to improve the packs quality as compared to the old bended roller (green banana roll, picture no.3). 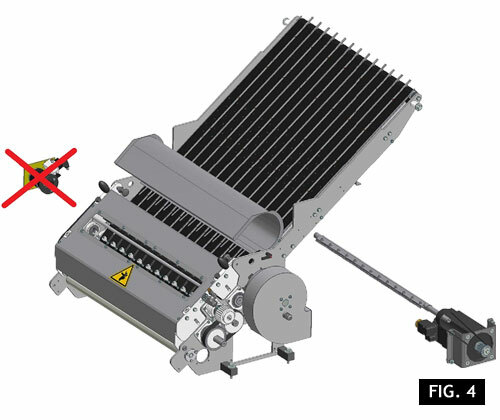 Together with the electronic tension system, this retrofitting also supplies a cutting group, totally revised both in the design and in the technological solutions. 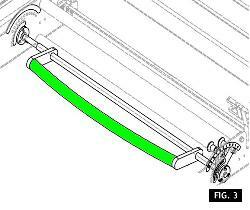 The upgrade provides a brushless motor dedicated to the rotation of the cutting blade and the possibility to open the housing area of the knife and rubber rollers by means of a hinge system and pressure spring designed for this purpose. 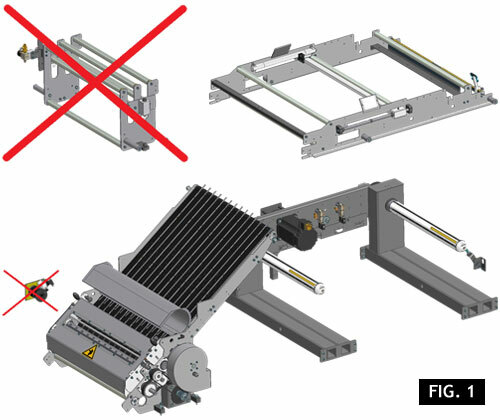 Maintenance costs and time are minimized, thanks to the elimination of the electro-pneumatic part that tends to lose efficiency over the time and requires frequent maintenance and adjustments, in order to ensure top-level performance. The use of the motor instead of the clutch has eliminated any inefficiencies due to delay in response times of the components, such as the clutch opening spring, the activation valve and the locking cylinder. The blade area is also integrated with a window which makes the group inner parts visible while it is operating without affecting the safety levels, thanks to a transparent protection. As a consequence, it is possible to follow the cutting process and point out any anomalies from the privileged point of view offered by this window. From shrink-wrapper SK 2° series and Combi machine “CM” (with Gefran thermoregulator in the oven). Not possible if PSHA handle applicator is installed. - Electronic film tension controlled by a position transducer.